Parking is free throughout campus after 3 p.m., except for areas designated as employee parking. Before 3 p.m., daily parking permits are available in the daily parking lots (Lot 15 and on the 5th floor of the Parking Garage, or at the north end of the campus in Lot 9.) Permits can be used in these lots or in any student lot; Lots 14 & 15 are closest to the Gallery. 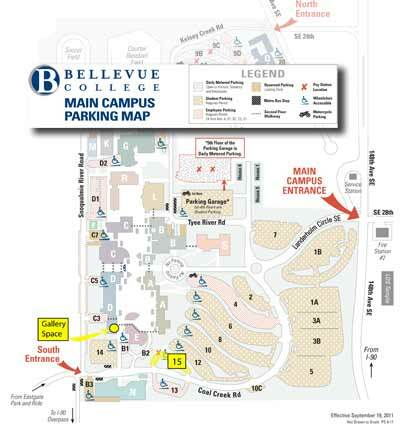 To reach the Gallery Space from Lot 14 or 15, walk north under the archway between Carlson Theater and Building A (refer to the gray dotted lines on the map below). The stairs to the second floor are on your right. On the second floor, continue west in front of Carlson Theater until you reach the Gallery. The Gallery Space is located in room D271, next to Carlson Theater and above the Library Media Center. BC Parking Map link will open a printable PDF version of the map below. we are located in building d, room 271, next to carlson theater and above the library. Contact Gallery Director Jono Vaughan for appointments and class visits.